Anyways, back to how this dessert came about. As I was turning those pints around checking out the strawberries, my son discovered the cakes next to the raspberries. He focused on the shortcakes and then quickly spotted the pink cakes that happened to be little angel food cakes. I never buy anything like that so I decided to splurge and let the little guy get his little cakes. After we got home, I grabbed a pint of the strawberries (I bought two) and stuck them in a bowl to get them nice and ready for the dessert I was planning. When you see shortcakes at the store and you have strawberries, there's of course, only one dessert that comes to mind. I wanted a little spin on that dessert though so the angel food was the perfect choice. 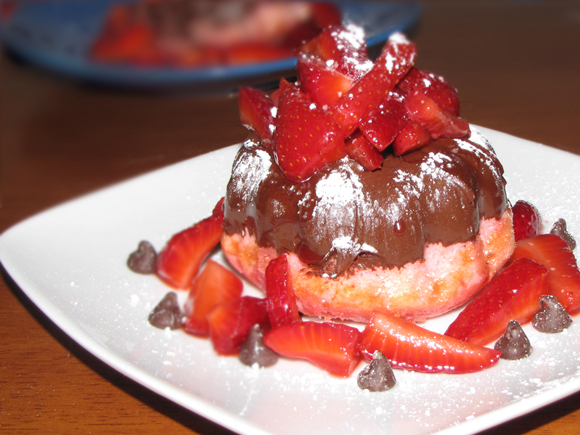 Adding a hint of almond extract to the strawberries and covering the cake with chocolate make it that much better. This is a great, simple dessert you can serve to anyone. The best part is that it costs so little to make but is really tasty and looks very elegant! It's perfect for a dinner party or just a special dessert night with the family because it's so quick. 1. Mix strawberries, 1 TB sugar and almond extract together. 2. Refrigerate for about 1 hour, stirring occasionally. Let the mixture come to room temperature before serving. 3. Melt chocolate in microwave safe bowl until just melted - about 1 to 1 1/2 minutes. Stir every 20 seconds or so to ensure even melting. 4. Dip the top half of each cake into the melted chocolate and allow to set. You can stick them in the fridge for about 5-10 minutes to speed this up. 5. Place cakes on a plate and spoon about 3-4 spoonfuls of the strawberries in the center of each. 6. Dust on a little powdered sugar and serve.